For me, however, it was the wrong kind of attention. All I could think was “How did he make tall, slender elegant Aussie actress Mia Wasikowska (who was “Alice” in Tim Burton’s recent “Alice in Wonderland” and Sophie in “In Treatment”) look so short and, well, squat? It was a reminder of the importance of proportion. See why I do NOT like the mid-calf skirt length? I know, I know, Isaac Mizrahi says it’s his favorite skirt length right now. But look at it. If it makes Mia look short-legged what is it going to do to those who do not have her long lithe legs? There are very few women who look best in this skirt length. It usually hits the calves at their thickest part and who wants a horizontal hemline across the thickest part of their calf? The bulky sweater doesn’t help, of course. It cuts the outfit in half and we all know that wreaks havoc with body proportions. We need to seek that 3:5 proportion or even 2:3, but never 2:2. 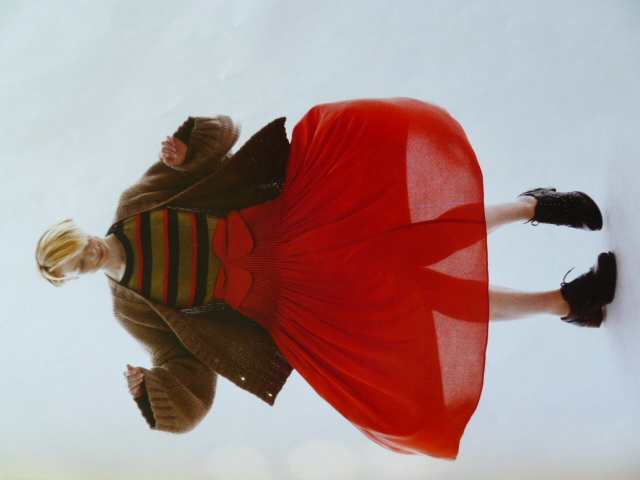 I would love the Marc by Marc Jacobs silk skirt and silk cashmere sweater if they were styled quite differently. No bulky sweater, and maybe some little Sabrina heels and a few chunky bangles? But event then, that hemline would have to be checked again. Do designers really expect us to embrace that hemline? This entry was posted in International fashion, Movies and tagged Elle, Gus Van Sant, Marc by Marc Jacobs, Mia Wasikiwska. Bookmark the permalink.